Think back to the reason you joined Toastmasters. Or if you’re visiting a club, what brought you into the room to check out Toastmasters? For many people, Toastmasters was sought as a place to practice and improve the art of public speaking. I would agree, except that the only reason I won is that everyone I competed against in that contest run was eliminated because of time limits. Yes, my fellow Toastmasters and future Toastmasters, I won because I stayed just within the time limits. But that’s another speech for another day. Today I come to you to talk about my secret method for creating speeches. After today, it will be known as my “not so secret” process since I’m also posting a blog on this topic. In Toastmasters just as in our professional careers, there will be many opportunities to sign up weeks in advance for presentations. There will also be those times that you have just the night before to prepare. Or if you’re like me, Toastmasters speechwriting was on your weekend list, below homework for class, spending time with your family, a mom-to-mom sale, and housework. 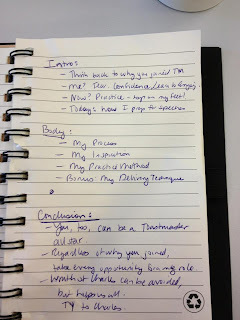 Yes my fellow Toastmasters, I admit I started writing this speech at 10:15 p.m. last night. The beauty of Toastmasters is that you’ll learn so many techniques that will help you in the speechwriting process and delivery. Today, I’d like to share with you four techniques. And as a bonus: my delivery method. So let’s start with my speechwriting process. I always start by identifying the objective of my speech, and tie it to a manual speech so I can get credit toward my Toastmasters program. I’m working on my CL manual right now, and identified I could use this speech for project 4, which deals with time management. How’s that for irony, by the way? I then write out an outline, thinking of a clever opening and witty conclusion, with three points to cover in the body. Okay, I added a fourth as a bonus section. Next, I write out the speech in a narrative format. I’ll practice reading it once or twice after I’ve written it, and that’s it. I’ll use my outline for practice. More on that later. So how do I come up with these fabulous speech topics? Well that’s easy. I choose something I like to talk about, and make sure it’s relatable to my audience. For today’s speech, this was a no brainer. Use my process as the topic. Pure genius! I’ll often use projects at work for my speech topics, since by delivering them here at Toastmasters, I’ll gain real, usable, productive feedback. Not the “great job Brenda’s” that I get at work, which really don’t tell me if the presentation was effective or not. But the descriptive, specific evaluations we can only get here at Toastmasters. Other times, I draw on my family as stories of inspiration. In fact, if you Google my name, you’ll find a YouTube video of me at Toastmasters describing my son’s Easter Egg hunt a few years ago. I have to confess: that speech was written the night before, too. Now onto my practice method. As I mentioned, I’ll write out my speech then read it through once or twice. Then, I collapse it into an outline that I use to rehearse my speech. In the car. Yes, that’s how I practice. Back in the beginning, I would actually practice my speech in front of a mirror or in my basement. But unless I give up more sleep – I don’t know where I would find the time to practice. We all have the same number of hours in a day, and we have to find the time for things we really want to do. I have to share that when I practice speeches while in the car, I’m entirely hands free and I’m keeping an eye on the road. The people next to me probably think I'm singing along to the radio! As I practice, I’m also envisioning delivering in the room. Once I arrive at the meeting, I’ll try to get up in front of the room to assess the “feel” for the group before the meeting starts, if I can. This reminds me though that my Toastmasters training has prepared me to be unprepared, and how to quickly prepare. In fact, today’s speech is little more than an extended Table Topic for me. If you attend a Toastmasters meeting, you’ll get the chance to try a table topic – even if you are not yet a member. Do yourself a favor: do one. Your mind will get practice that will pay off huge in the long run. My last point I’d like to address regarding my now not-secret speech process is in my delivery. I will make an effort to ensure I’m having fun up here. I start my speeches by walking to the front of the room with a swagger and a smile, like I’ve just won an award that I’ve worked really hard to earn. I’ve noticed that if I have a strong, confident opening, and I’m enjoying my speech, my audience will too. You should try this sometime! 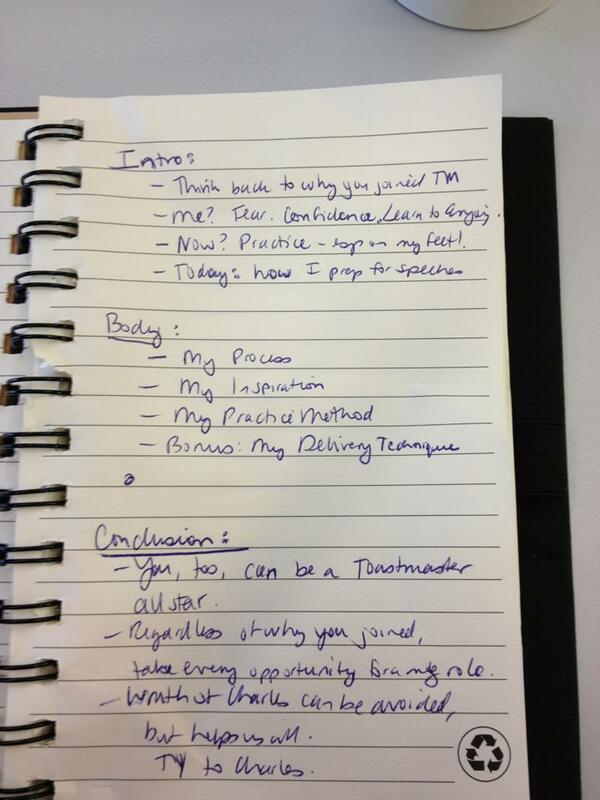 In summary, my fellow and future Toastmasters, I’d like to say that you, too, can be a public speaking all star. With just a little practice – okay a LOT of practice – you will learn that Toastmasters teaches you techniques that will help you think on your feet, find time when you have no time, and make you a stronger, more capable presenter in any situation. I’ve learned that whether you’re here at Toastmasters in a safe environment, or at work in a professional situation, you should honor your obligations. Oh, and I’ve also learned that the wrath of Charles is something you CAN avoid by not coming to a meeting, but in the long run, he’s doing all of us a favor by holding us accountable to become better speakers.